Well it’s that time again so get the kettle on for the Tinpot Teaparty! 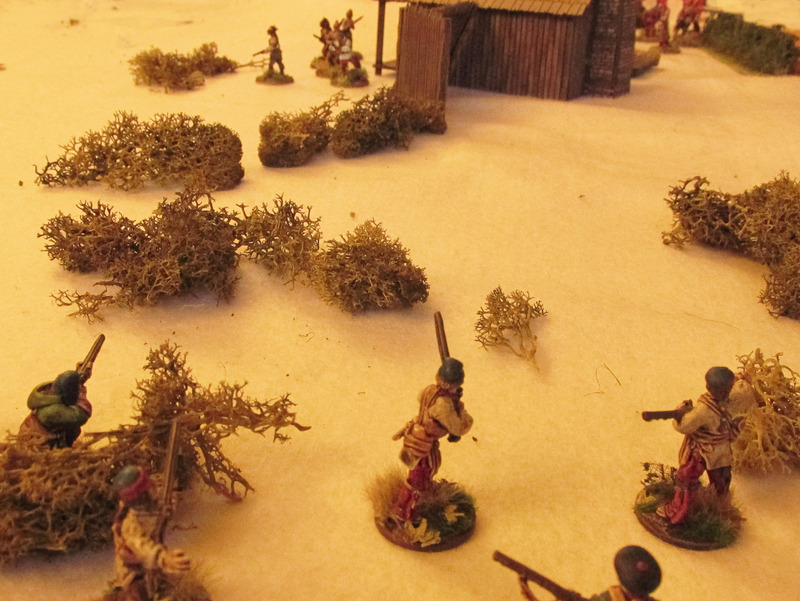 The Old Guard and I have had a few of games of Muskets & Tomahawks recently and I have put together a gallery of pictures from the first battle earlier in the month. Another crushing victory for The Old Guardsman! I did however get my own back during our last battle but alas the batteries ran out in my camera and so my victory goes undocumented here. 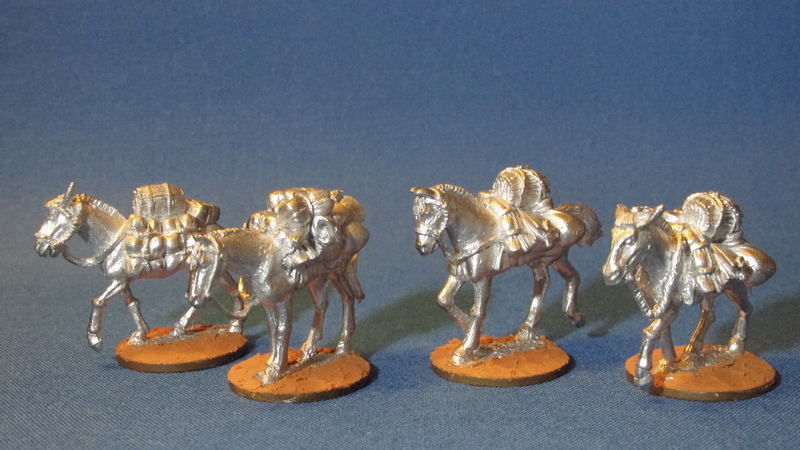 All this activity at the gaming table has at least helped to keep me inspired enough to get the lion’s share of my miniatures painted and ready for a coat of Quick Shade. 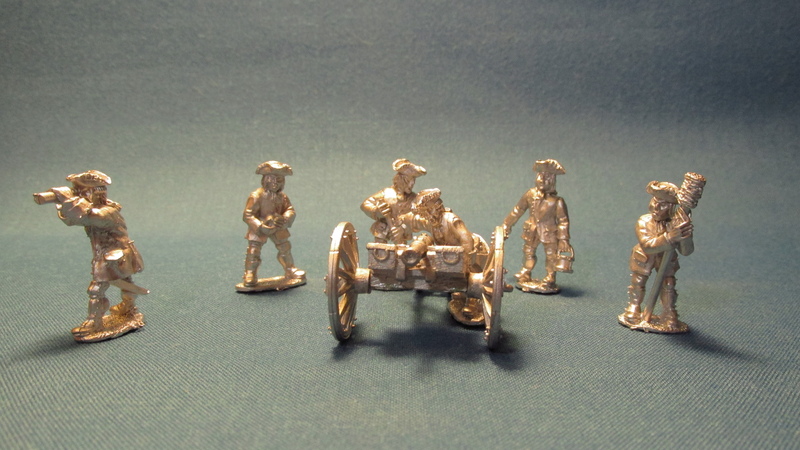 All that remains to be painted are these newly acquired purchases from Foundry Miniatures. Real life can often get in the way of my hobbies, including this very blog and I have been pondering how best to commit myself to post more regularly in 2014. I will endeavour this year to write at least one post every month and in this I hope my friend ‘the Old Guard’ will be of much aid. We have decided to have a gaming session once a month, so this is the perfect opportunity for me to write about our battles. 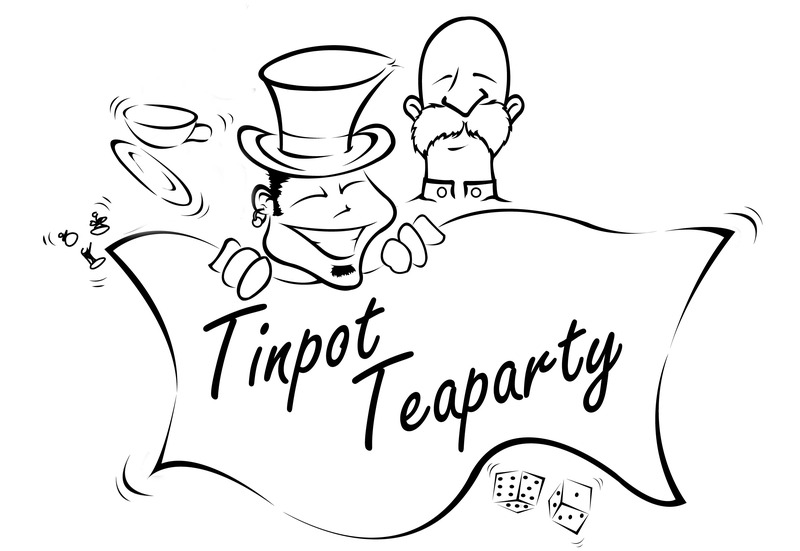 I will also keep posting about what I’ve been getting up to whenever time and inspiration permit… Welcome one and all to the inaugural Tinpot Tea-party! 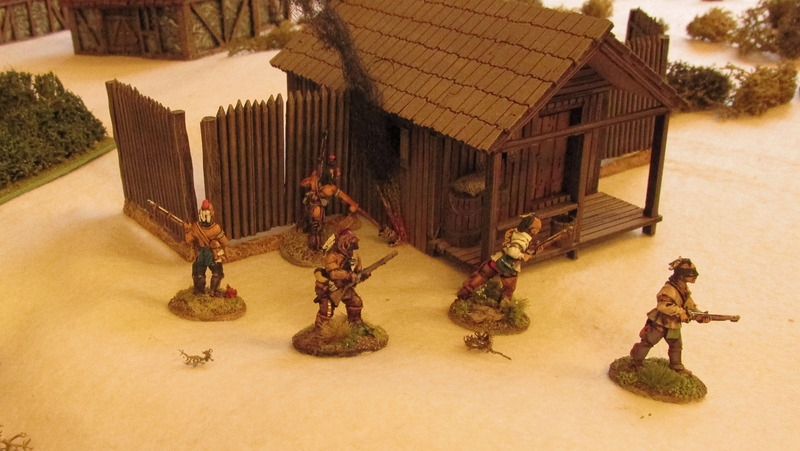 Canadian militia have been hastily formed to repel an Indian raiding party. putting the building to the torch and readying to storm the door. The Canadians spot the raiders and make ready to fire! My troops were given the ‘Engage’ objective to destroy 2/3 of the enemy force whilst the Old Guard’s Braves received the ‘Raid’ objective in which he had to burn down the buildings. 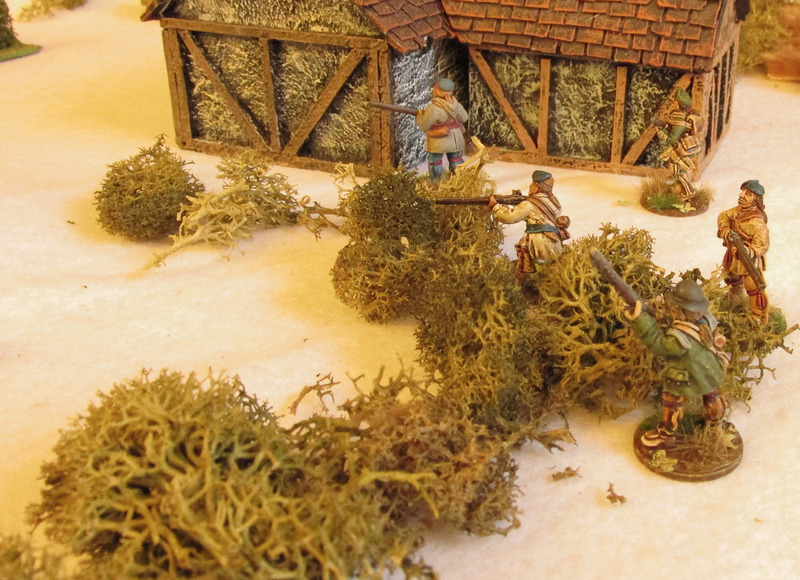 Unfortunately for me the scatter-dice rolled for deployment put me some distance from two of the buildings, whilst the other was within spitting distance of the Indians! My Canadians made steady progress toward two buildings on their right flank as the Mohicans put the wooden shack to the torch and managed to counter attack one group of Braves, giving them a volley before brandishing tomahawks in a fierce charge and destroying them to a man. My folly was in failing to secure the buildings with my other two units who then watched the Indians run past them and burn the buildings down from under my nose!… Oh well, lessons were learned and I thoroughly enjoyed facing off against the Old Guardsman, he’s a spiffing old bean and always most pleasant company. As both the Old Guard and myself are relative newcomers to this rule set, it being my first game and only his second, I balk at giving comment. It seems like a fairly straight forward game and I do like the unit coherency rule which allows you to spread troops out a little more than some skirmish games (up to their movement allowance). I would have liked to have found out a little more about how officers work, I gather that they can influence friendly troops in their immediate vicinity but Militia Officers have the scout rule which I didn’t take the opportunity to find out about, remiss of me I know, hopefully I will get the chance to investigate a little more sometime soon. 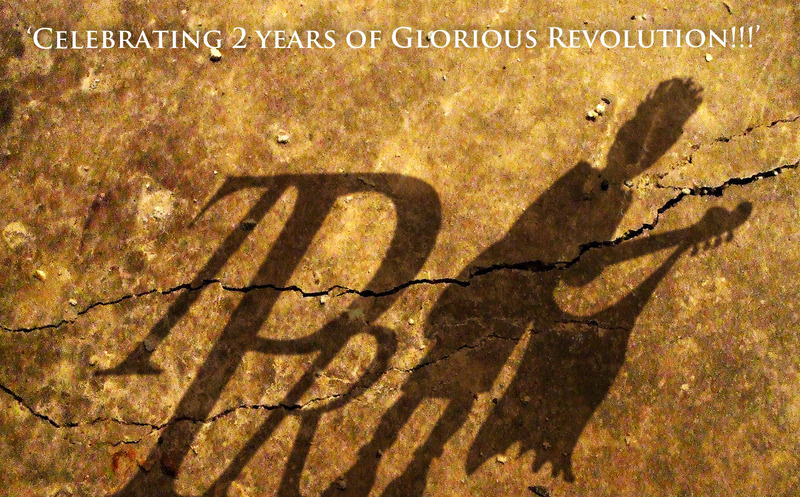 Over the years I have played in several bands but one in particular holds a very special place in my heart. The Skanx was a punk-rock cover band that my good friend, ‘Charlie’ Dave’, formed in aound 2006-07 and I joined on bass guitar sometime later. I have had an all-encompassing love for music since I was young and I enjoy listening to all kinds, but I had only a cursory knowledge of punk-rock, having only listened to bits and pieces on the radio, so the chance to find out more about the ‘Punk Revolution’ of the late 1970s was most welcome! And what an eye opener it was! I loved the pure power and intelligent lyrics of bands such as the Clash, there go-getting attitude and D.I.Y mentality, motivating people to get up and do something about making their lives better. After having been given a CD full of tracks to learn, I went to the rehearsal rooms where I met ‘Guitar’ Dave, his wife Jools and son ‘Billy’ Bob who are wonderful people that I have great affection for, and also the lead singer ‘Shauny’ who is the most ‘Punk-Rock’ bloke that I know! 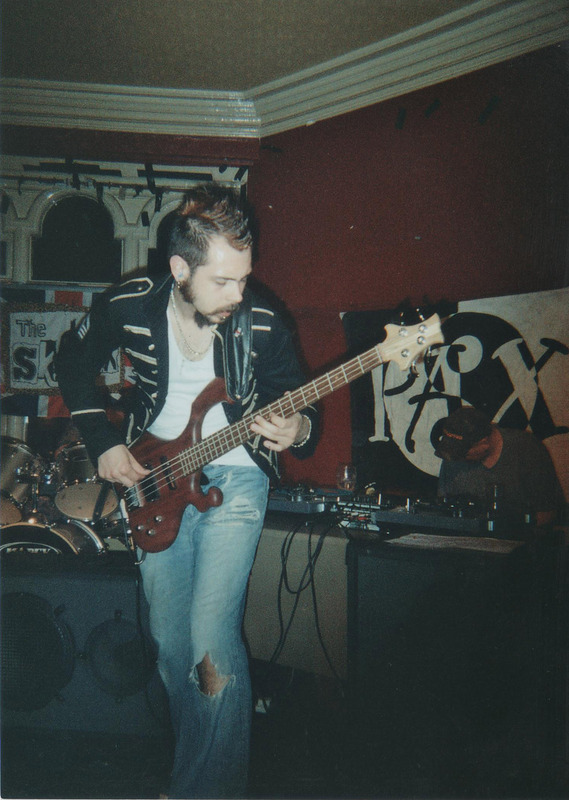 After one of the first gigs that I played with The Skanx, my girlfriend of the time mentioned that I didn’t look right on stage; the other guys where ‘proper’ punks and I just didn’t look the part. Not the most glowing piece of feedback! But it was a fair comment all the same, so I had a little think about it and decided to create a ‘stage persona’ for myself! I proceeded to get my hair cut into a Mohican and bleached (as the picture below shows the bleach never really took!) and after a chance encounter with an alternative clothes shop in Great Yarmouth (of all places!!) I had a military style jacket to wear. My love of playing soldiers as a child ( I even had my own little uniform!) has never really left me and so it seemed only natural! 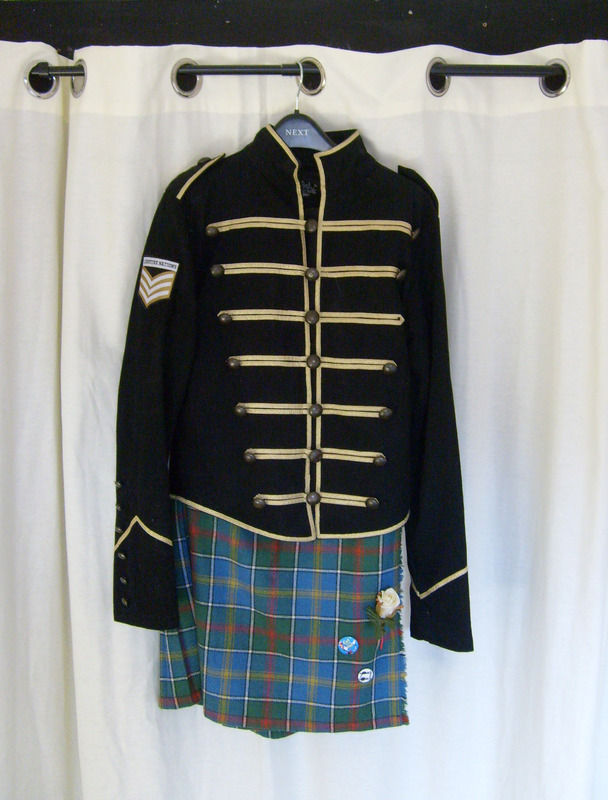 After I had played a few more gigs with the band, Jools mentioned that she thought I should wear a kilt, I thought it was an excellent idea and as ‘Guitar’ Dave had one that he let me have, I had became a Highlander and now all that was needed was a musket! Up till this point I had been using one of the instruments that I built (pictured above) and this may sound strange, considering I used to hand-make instruments in my spare time, my personal taste is more toward the more rough, beaten-up look and so I built my very own Franken-Basstein! I absolutely love this bass, it will always be my favourite and most trusted instrument, and it isn’t even as old as it looks! I did a bit of ‘antiquing’ on it with a chain!! It also has key features such as an old left-handed neck bolted on to a right-handed body (Well spotted in my last post Mr Arkie), lots of ‘cool’ stickers and a block of MDF mounted under the strings ’cause my plucking hand kept falling off the ‘skinny’ pickups! I had some wonderful times with The Skanx and made some very special friends, all of which, came at a very important time in my life personally and so it was with some regret that I eventually chose to leave the band.